With several prominent QB jobs still unsettled as spring practice closes, the coaches with crucial decisions ahead each have their own criteria to keep in mind. Plus, highlights from spring games around the country, club bangers from the late '90s and early 2000s and the rest of this week's Punt, Pass & Pork. We examined some of the nation’s most intriguing quarterback competitions last week, but it’s time to drill down deeper. What exactly are coaches looking for before they make a decision? Is it a grasp of the scheme? Command of the team? Or, in some cases, is it something more specific? Here’s Saban talking about his QBs with what appears to be a hot mic. O.K., perhaps it’s unfair to start with the program with the quarterback competition that likely will dominate the offseason discussion. Still, Alabama coach Nick Saban’s unwittingly open-mic’d critique of Jalen Hurts deciding to run instead of trying to remain behind the line of scrimmage and throw a pass might be the most unvarnished take we’ll get from coaches who want badly to keep the juiciest aspects of these quarterback competitions out of public view. Or perhaps this one—willingly offered on the record by LSU coach Ed Orgeron after the Tigers’ spring game—is the most accurate. As the NFL draftniks debate which signal-callers should go in the Thursday’s first round, there seem to be more quarterback jobs open than ever in the college ranks. Saturday, we saw a three-man race for a wide-open job (LSU’s Justin McMillan, Myles Brennan and Lowell Narcisse). We saw a former backup (Alabama’s Tua Tagovailoa) gain on an experienced starter (Hurts) without even playing in the spring game. We saw a two-man race being judged by a first-year coach (Nebraska’s Scott Frost) between quarterbacks (redshirt freshman Tristan Gebbia and early enrollee Adrian Martinez) who have yet to play a college snap. We saw an early enrollee (Georgia’s Justin Fields) trying to beat out an entrenched sophomore starter (Jake Fromm) who last year was an early enrollee trying to beat out an entrenched sophomore starter (Jacob Eason). Smart is holding a quarterback competition by choice. Other coaches in his situation might simply roll with Fromm and let Fields be content to be a backup. But Georgia won the SEC and reached the national title game last season because Fromm wasn’t content to be a backup. He competed with Eason into preseason camp, and because of that, he was ready to step in when Eason injured his knee early in the season opener. The competitions at Georgia and at Alabama and Clemson—where potentially more talented younger quarterbacks hope to beat out last year’s starters—are good problems to have. One of Smart’s former co-workers hasn’t been so lucky. Texas coach Tom Herman, who has Shane Buechele and Sam Ehlinger dueling for the second consecutive season, offered a relatively simple four-point formula for determining a winner. Does the ball move when they’re in? Do they protect the ball? Do they make the players around them better by being behind center? Herman did not mention winning the Circle of Life drill, but presumably he’ll take Saturday’s outcome into account. At Nebraska, Frost said something similar Saturday. The transfer of Patrick O’Brien left Gebbia and Martinez as the front-runners to pilot Frost’s offense, but Frost isn’t ready to make a decision. Martinez starred Saturday by accounting for four touchdowns. Even though no one was allowed to tackle him on this play, it seems unlikely anyone actually would have. It also looks like something the Nebraska faithful would appreciate. Most of these quarterback competitions will have to wait until preseason camp for further clarity. Ohio State’s might be decided earlier because redshirt junior Joe Burrow is on track to graduate in May and Buckeyes coach Urban Meyer told ESPN last week that he owes Burrow a decision in his competition with Dwayne Haskins. Barring a surprise transfer, the rest of the competitions likely will either get decided the week of the season opener or drag into the season. As the spring games end and a long, hot summer of speculation begins, at least we’ll have plenty to talk about. Last week’s ranking of power ballads released between 1988-92 was my most controversial since the July 2017 ranking of songs from Disney movies. It also was one of my favorite topics because it truly emphasized the random part of the Random Ranking. So let’s shift 10 years, move from rock to hip-hop and rank the best Club Bangers released between 1998-2002. (And before you write in, 50 Cent didn’t release “In Da Club” until 2003.) I’d embed the videos, but naughty words. 3. “Ante Up (Robbin Hoodz Theory)”, M.O.P. *Thank Peter Burns of the SEC Network for reminding me that this list would be incomplete without the junior senator from North Carolina. **How ahead of the curve were the Ying Yang Twins? Society hadn’t even decided how to spell the word “twerk” when they released this song. 1. This may drive some of you crazy, and that’s fine. But UCF—which only started playing football in 1979 and therefore missed most of the age when college football teams could just declare themselves national champions willy-nilly—continues to make up for lost time. During Saturday’s spring game, the Knights revealed the national title rings the members of the 2017 team received. 2. Take from this what you will with regard to Alabama’s current quarterback competition, but Tua Tagovailoa’s younger brother Taulia—who also plays quarterback—committed to Alabama on Saturday. I’d like to thank SI college football editor Eric Single for putting up with me sending four different versions of today’s Random Ranking. “Do as many as needed,” Single wrote after I sent the final version. “This is not something we can afford rushing through.” It’s great to work with people who understand what matters. • It made tequila feel like a punishment. • We could only afford really cheap tequila. 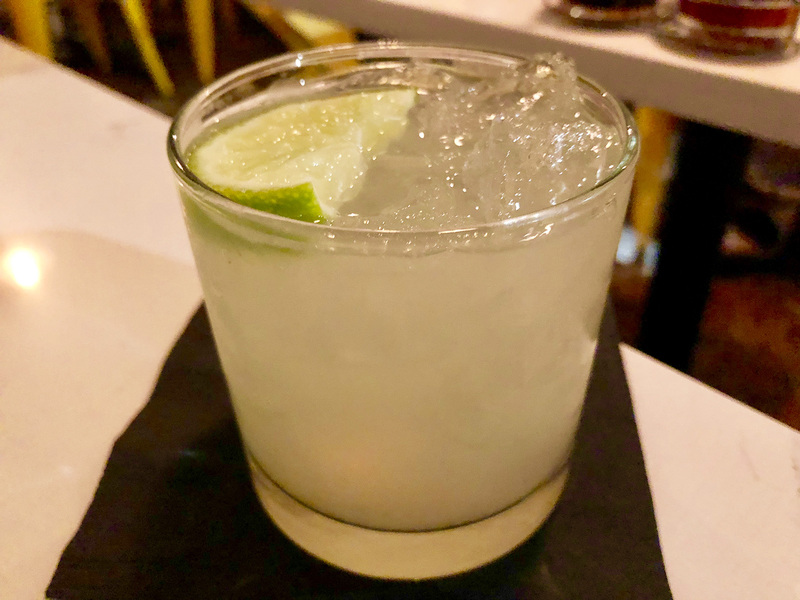 Combine that with the toxic sludge that passes for a frozen margarita at most beachside hotel bars, and tequila might be the most under-appreciated of the common hard liquors. And because of that, the good margarita might be the most under-appreciated of the common mixed drinks. What is a good margarita? It’s simple: fresh lime juice, orange liqueur and tequila over ice. Rim the glass with salt if you choose. Or don’t. But now that we’re in the cocktail renaissance, it’s time to ask another question. How does one turn a good margarita into a great margarita? Can a bartender add an ingredient to this classic mix that elevates it? The answer is yes, but there isn’t a specific liqueur or fruit that does the job. It’s more of a sensation. The best example I can give is the margarita I drank earlier this month at The Peached Tortilla in Austin. The place mashes up Asian, Mexican and Deep South comfort food, and that results in banh mi tacos, popcorn ice cream and the Margarita de Peached, which features lime juice Cointreau, basil and habanero-infused tequila. Yes, you read that correctly. Peached Tortilla bartenders soak habanero peppers in tequila. When that tequila gets mixed into the margarita, it produces a drink that throws a tiny fireball onto the taste buds at first contact. Then that fireball gets doused by a wave of ice-cold lime and orange. Few sensations are more refreshing. At first, the idea of heating up a beverage meant to cool down the drinker seems counterintuitive. But in practice, the initial burst of heat amplifies the refreshment once the rest of the cold liquid crosses the tongue. But dunking habanero peppers into tequila isn’t the only way to achieve this sensation. When I returned home, I visited a bar that served a different drink that utilized muddled jalapeños and ghost pepper bitters. I asked if they’d make me a classic margarita with those muddled jalapeños and ghost pepper bitters, and it was almost as good as the margarita at The Peached Tortilla. The basil in The Peached Tortilla’s margarita put it over the top because it added an additional cooling effect, but I was pleased to know the effect could be recreated in various ways. So as the temperature rises, add a little heat to your margarita. It will cool you down even more.